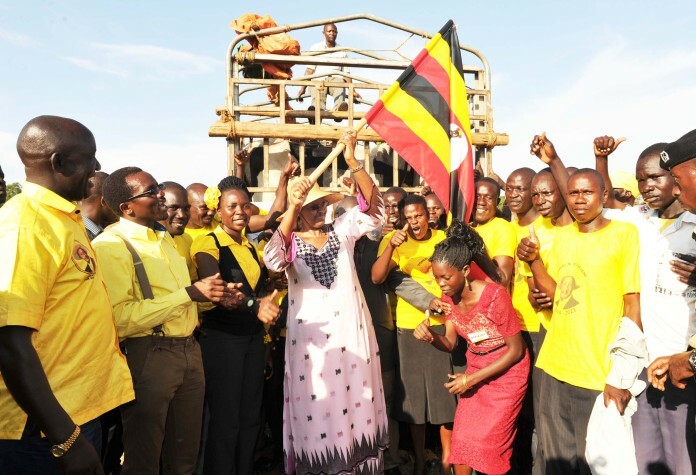 First Lady Janet Museveni flags off the distribution of heifers to the Gurudumu Ya Mabadiliko youth group from the 8 Districts of Teso region. The First Lady and Minister for Karamoja Affairs Mrs. Janet Kataaha Museveni has urged young educated people to get into agriculture which she said is the bedrock of African economies and is what will bring real transformation to Africa. She said it is shameful that Africa which is a blessed green country with a good climate and could be the food basket for the world, stands today as the poorest continent on earth with some African countries importing food and fruits from Israel which is a desert, and also from as far as China. The First Lady was addressing the youth from the 8 Districts of Teso region who converged at Soroti Boma Grounds on Sunday to witness the launch of Gurudumu Ya Madiliko Youth Group. The group members drawn from the Districts of Katakwi, Amuria, Kaberamaido, Soroti, Kumi, Serere, Ngora and Bukedea plus Soroti Municipality are committed to championing agriculture as the real source of their transformation. They have been mentored to become productive and role models for President Museveni’s 4-Acre strategy of wealth creation for small land holdings. Mrs. Janet Museveni also flagged off the distribution of Heifers by NAADS to the youth group members. She urged the youth to focus their energy on real work in agriculture and become the engine that drives the country’s development instead of being used to destroy the things already built. She said if they utilize some of their parents’ land for agriculture, get inputs from NAADS and work hard using the skills they have attained through education to manage these enterprises, they will take off without a problem and become an example to other youth in the country. “Your taking off will be the pride of President Museveni who is forever looking for youth groups which arewilling to work and succeed”, she said adding that they are lucky to have elders who give them guidance so that they become useful people in the future as God destined them to be. Janet Museveni lauded the group’s Patron Dr. Kenneth Omona, who is the MP Kaberamaido and Deputy NRM Treasurer, for mobilizing the youth and giving them the wisdom to look at agriculture as a source of income. Hon. 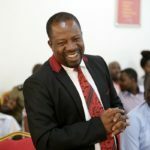 Dr Kenneth Omona reported that the Gurudumu Ya Mabadiliko Youth Group founded in 2012 under the theme ‘Youth productivity”, has a total of 144 members and four investment projects which include citrus fruits, cassava, diary through improved milk animals and poultry through the rearing turkeys have been approved. He said with the prevailing peace and stability in the country and the sprawling infrastructure developments like roads and electricity, it would be an insult for the youth to keep on lamenting and making poverty their identity and signature song. The State Minister for Teso Affairs and Woman MP Soroti Christine Aporu Amongin thanked the youth of Teso region for accepting to fight poverty and urged them to work very hard and look after the heifers so that they produce enough milk and to make the milk coolers donated by President Museveni functional. 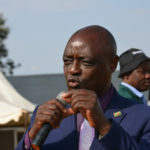 The State Minister for Relief, Disaster Preparedness and Refugees also MP Amuria Musa Ecweru said that it is gratifying to see youth decide to work to eradicate poverty instead of just lamenting because no individual or community has ever overcome poverty through tears. In his remarks NAADS Executive Director Dr. Sam Mugasi said they have so far distributed heifers to Youth projects in the Buganda region which received a total of 384, Busoga 160 and Teso whose 128 heifers were handed over at the function. He said this will be rolled out to cover all Districts in the country. The group’s chairperson said Gurudumu Ya Mabadiliko literary means ‘wheel of transformation’ and they are the first to implement the four acre model in the country through the help of NAADS. They have each planted an acre of cassava, an acre of citrus fruits and an acre of grass. They have also received 12 iron sheets for constructing the cow pen for the heifer they will each receive. He said the Group has started a SACCO that will enable them access small finances to support their projects. During the function, Janet Museveni was introduced to Ocen Patrick aka Olanya, a youth from Arapai Sub county in Soroti District who fabricated a 2.5ml NRM car built with ordinary mabati material used to make metal doors which he mounted on an engine. Ocen was later introduced to President Museveni who had dropped in at the East African Civil Aviation Academy in Soroti.